Anansi Boys [Audiobook Review] – my books. my life. This review is going to be short and sweet mostly because I finished Anansi Boys ages ago and I’ve forgotten everything I had to say about it. Between that and not posting for a week, I’m feeling like a bad book blogger. But thanks for reading this anyway. How do I describe the plot of Anansi Boys? Well, we have Fat Charlie, our main character, a Floridian turned Brit of West Indian descent. Fat Charlie is not really a fan of his dad because he always embarrassed Fat Charlie as a kid. But when his father dies, Fat Charlie gets dragged back into his world. Because the thing is Fat Charlie’s dad is Anansi – the mischievous spider god of West African folklore. As you may guess, mischief ensues. First, Fat Charlie meets his long lost brother, Spider. And Spider certainly knows how to cause mischief himself (it’s explained that he got the divine powers side of the family). Then Spider steals Fat Charlie’s fiancé and ends up getting Fat Charlie framed by his boss for embezzlement. After Spider’s visit, Fat Charlie must find a way to get his normal life back. The book continues both in the present world and the “beginning of the world” where Fat Charlie encounters all of the ancient gods, represented by other animals. 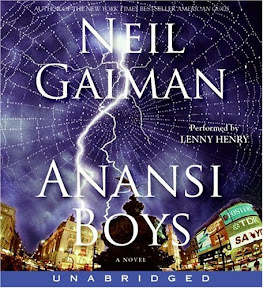 Anansi Boys is a cleverly woven story of the plausible and the impossible. It has magic but only just enough magic. I think I can honestly recommend it even if fantasy isn’t necessarily your thing. I just (as in two seconds ago) learned that Anansi Boys is a spinoff of American Gods (which I have not read). I’m not sure how that should affect my understanding of the novel. I felt it stood on its own pretty well. Once again, Neil Gaiman has created a fantastic world the you won’t want to leave. His power over the language, his vision of rich and unique characters, and his ability to weave a complicated web (pun totally intended) of a story never ceases to amaze me. Hmm…That wasn’t exactly short and sweet now, was it? I loved Lenny Henry’s narration. His interpretation of the wide array of characters in Anansi Boys was fantastic. He easily switched between the British and Caribbean accents. He captured the smooth-talking Spider, the ancient Callyanne Higgler, and the pompous Grahame Coats. I highly recommend listening to this one – you’ll be in for a treat. This is my second Gaiman audiobook and I have to agree that you can’t go wrong with him. Loved listening to him read Stardust. I tried reading this in print once and didn’t get far, but I’ve been told the audio is amazing, so I’m planning to listen to it that way! The narrator absolutely made this book for me. I really enjoyed the audiobook…I hope you end up liking it too! I have a feeling that this is one of those books that is better in audio. Lenny Henry is simply wonderful. I am from the Caribbean and I love the folklore stories of Anansi the spider. Your review has made me want to read this novel so badly. Good Job. I’m sure you’ll love this then. I *loved* this audiobook! The story was good, but it was the narration that made the book for me. I’ve not read American Gods and also didn’t realize the two are connected. Will have to check it out. Yes. I think the stories must stand alone pretty well but now I’m even more anxious to read American Gods to see the connections. I loved this one and it was particularly good on audio. Sometimes the reader can just make the book so perfect. I love Neil Gaiman! After I’m done with The Graveyard Book, I may pick this one up. On audio. Woo!